Cuisinart Gas Grill Just $38.26! Down From $90! PLUS FREE Shipping! You are here: Home / Great Deals / Amazon Deals / Cuisinart Gas Grill Just $38.26! Down From $90! PLUS FREE Shipping! At Amazon, you can score this Cuisinart Portable Gas Grill for just $38.26 down from $89.99 PLUS FREE shipping! It’s time to get your grilling game rolling with the Cuisinart searin’ sphere portable gas grill. 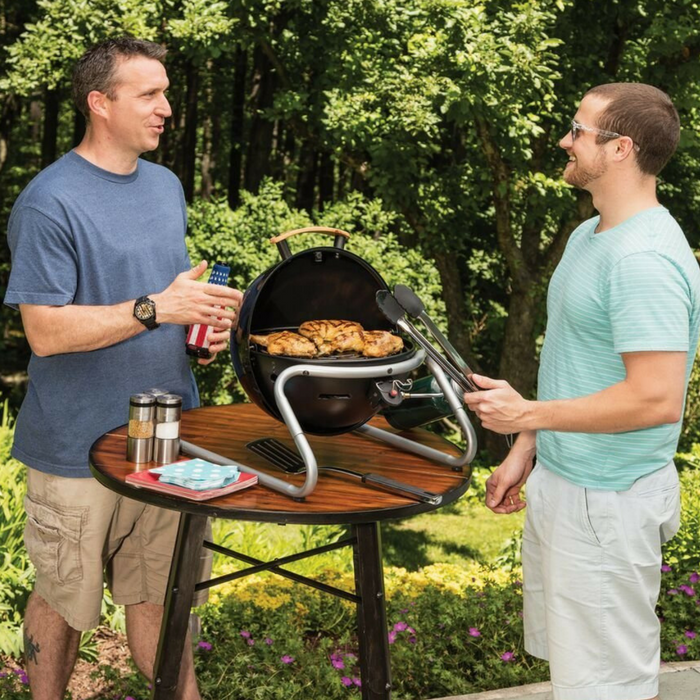 The design of this grill is perfect for portability, convenience, & making a great meal! This compact look has a hinged lid that rolls under the grill for smooth, compact use. The convenient & compact use of the grill is only rivaled by its convenient & compact portability. The locking lid, wooden handle, & tubular Leg design make carrying & transporting the grill extremely easy & cleanup has never been easier! With a dishwasher safe, porcelain enameled cooking grate, cut out the hassle of scrubbing down the grill after each use. Start grilling in style with the Cuisinart searin’ sphere portable gas grill & never look back!